Many consider Beyoncé to be a body confidence role model. Not only does she have curves, but is ridiculously strong, toned and has an overall fantastic physique. However, it has taken the mother-of-three a while to figure out how to be the best version of herself — and to do it the healthy way. "I am not naturally the thinnest woman," she confessed during an appearance on “Good Morning America.” "I have curves. I have struggled with diets and finding something that works for me." Here is everything Mrs. Carter has learned about nutrition, from her tips and tricks to everything she eats in a day. While Beyoncé isn’t a full-fledged vegan, she and her husband Jay-Z are fans of a plant-based diet. The duo first endorsed a vegan diet back in 2013, after getting introduced to it by their personal trainer and nutritionist Marco Borges, partnering with him on his 22 Days Nutrition meal delivery service. "The benefits of a plant-based diet need to be known," she wrote in an email to the New York Times in 2015. "We should spend more time loving ourselves, which means taking better care of ourselves with good nutrition and making healthier food choices." 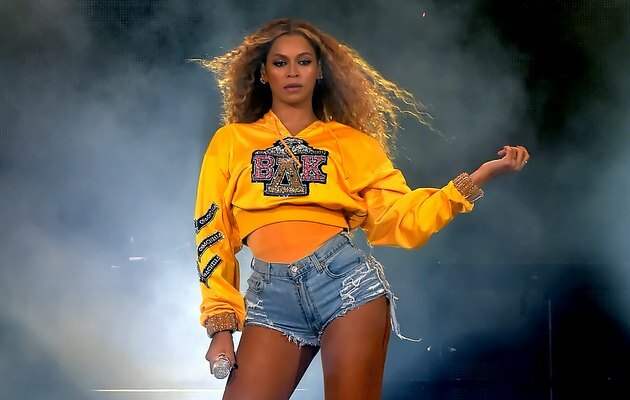 Occasionally, Bey will go full-on vegan — for example, in preparation for a big event like Coachella — and she claims it does her body good. During her “GMA” appearance, she said, "I felt like my skin was really firm; a lot tighter when I deprived myself of food. And the weight stayed off." While she doesn’t live the meat-free life all of the time, she maintains that the program has been truly transformative in regards to her approach to diet. “We used to think of health as a diet—some worked for us, some didn’t. Once we looked at health as the truth, instead of a diet, it became a mission for us to share that truth and lifestyle with as many people as possible," Bey and Jay recently wrote in the introduction to Borges’ latest book, "The Greenprint: Plant-Based Diet, Best Body, Better World." If Bey doesn’t have time to get a meal in, she fills up with a plant-based protein powder shake. In fact, her powder of choice is Borges’ 22 Days Protein Powder, a USDA organic, non-GMO, gluten-free and vegan blend of blend of organic superfoods, pea protein, and flax sweetened with stevia and cacao. Like many other celebrities, Beyoncé tries to stick to a clean diet — basically no processed foods — most of the time. "I always have breakfast — say, scrambled egg whites, a vegetable smoothie, or whole-grain cereal with lowfat milk,” she told Shape. Of course, while she is partaking in veganism, she clearly has to make modifications. Judging from one of her Instagram posts, Bey might be “Crazy in Love” with avocado toast like the rest of us. According to Elle, one of her favorite plant-based salads is from Los Angeles vegan hotspot Café Gratitude. It consists of kale, cucumber, carrots, nori sheets, cilantro, basil, scallions and toasted almonds and is topped with a tahini, lemon, olive oil, garlic, and sesame oil dressing. Borges also revealed that she loves a crunchy salad composed with arugula, red quinoa, cantaloupe and slivered almonds, topped with olive oil, apple cider vinegar and maple syrup. In preparation for her critically acclaimed role in “Dreamgirls,” Beyoncé put the Master Cleanse — aka the cayenne pepper, maple syrup and lemon juice cleanse — on the dietary map. The singer was under pressure to drop 20 pounds in a hurry, confessing to Oprah that while it helped her to lose the weight, it was not healthy. "I wanted to lose weight and make a physical transformation. And it was difficult because I love food. I love to eat," she said. "I did a fast, a master cleanse for 14 days. Everybody was eating Krispy Kremes around me. I was grouchy, but I did it and I lost the weight." These days, if she wants to drop pounds quickly, Bey relies on Borges' plant-based diet. While she eats healthy most of the time, Bey knows the importance of indulging every now and then. “I always treat myself to one meal on Sundays when I can have whatever I want. Usually it's pizza, which is my favorite indulgence," she told Shape magazine. Some of her other favorite cheat meals include In-N-Out, pasta, soul food (true to her southern roots) and Cheetos. In addition to drinking lots of water, Beyoncé also revealed to People that she takes vitamins daily. While eating a well-balanced diet is the best way to get your recommended daily vitamin intake, taking them in pill form ensures that your body will get everything it needs to operate at a functional level. While Beyoncé doesn't overindulge in alcohol, the singer does enjoy having a drink on occasion. Some of her favorite adult beverages include red wine, rosé and limoncello. While Beyoncé is certainly disciplined with her diet, her overall approach to eating is super healthy and totally doable. While she makes sure to eat healthy most of the time, she allows herself occasional indulgences — because life is too short, right?